Heat the oven to 180°C. Take the duck pieces out of the fat (save it to use for potatoes and keep the rest in the fridge) and place on an oven dish and heat through for about 20 minutes. Place the potato cubes in an oven dish and add some of the duck fat. Cook for about 30 minutes or until the cubes are cooked through and crisp. Shred the duck meat discarding the bones. Place in a bowl and while warm add a couple of spoonsful of the dressing. Mix in the beans. Separately drizzle a little dressing over the figs. 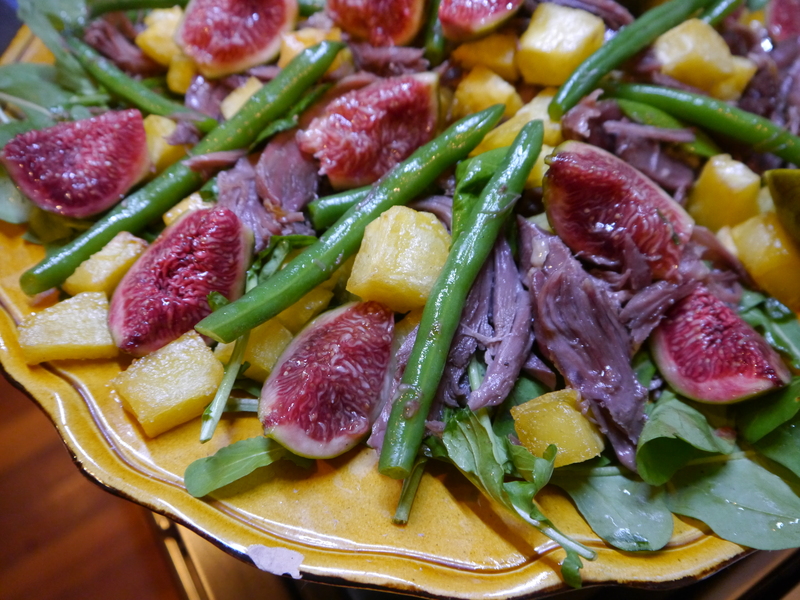 Assemble the salad on a platter – rocket first then the shredded duck and beans, add the fig pieces and finally the crispy potatoes cubes. Drizzle with the dressing and serve at once.